Professor Lewis joins leading modern livery company. 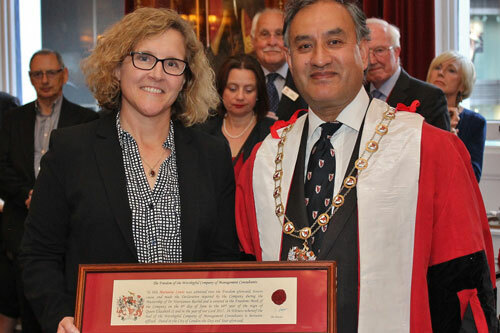 Professor Marianne Lewis, Dean, Cass Business School has been admitted as an Honorary Freeman of the Worshipful Company of Management Consultants (WCoMC). Professor Lewis was admitted by Dr Noorzaman Rashid, Master, WCoMC, at a ceremony at Armoury Hall in the City of London. After being presented with the Award, Professor Lewis gave a keynote lecture to the Company about paradoxes in leadership. Professor Lewis said it was a great honour to be admitted as a Freeman of the Worshipful Company of Management Consultants. “I thank Dr Rashid and the Company for this wonderful honour. Cass Business School and City, University of London have unique and deep-rooted links with the City and its livery companies. Founded in 1992, the WCoMC is a modern livery company which represents management consultants, giving members a unique opportunity to engage with those shaping the future of the City and the UK. The WCoMC is a Charitable Enterprise, incorporated by Royal Charter and is an integral part of the network of the City of London and the Lord Mayor. L-R Professor Marianne Lewis and Dr Noorzaman Rashid at the ceremony.